JINGLE DANCER by Cynthia Leitich Smith, illustrated by Cornelius Van Wright and Ying-Hwa Hu (HarperCollins, 2000). Jenna, a contemporary Muscogee (Creek) girl in Oklahoma, wants to honor a family tradition by jingle dancing at the next powwow. But where will she find enough jingles for her dress? A warm family story, beautifully evoked in Cornelius Van Wright and Ying-Hwa Hu’s watercolor art. 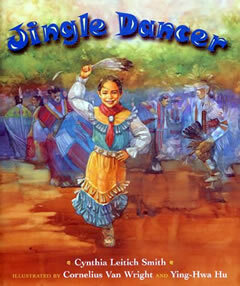 Order JINGLE DANCER by Cynthia Leitich Smith. Featured Title, Native American Children’s Literature Reading List (First Nations Development Institute). Discussion Guide for Jingle Dancer from First Nations Development Institute. Teacher and Librarian Resources for Native American Children’s and Young Adult Books.